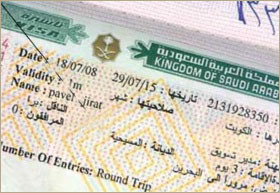 In order to get you Hajj visa from Saudi Consulate we will require following documents. Inoculation against meningitis shots original certificate. Copy of marriage certificate for a couple. Submit Four recent passport pictures with white background only. Submit a passport that is valid for seven months from the date of travel. passport must have two visa blank pages side by side, it is must. For Non-US citizens, provide original Green Card, or copy of advanced parole, or one of the following valid visa endorsed on your passport: H1B, H-3, H-4, L-1, F-1, J-1, M-1 and R-1. Copy of color Green Card and original green card (For non-US Citizens). Pilgrims who have non-Islamic names must have a certificate or a letter from a Islamic Center showing their conversion to Islam. VAT 5% to be added to package as per Saudi government new rule eff Jan 2018. Additional charge of $550 per person who performed Hajj in past 5 years. All documents required with return paid overnight FedEx envelop only. (Please do not use any mailing service other than FedEx).